Indiana’s voucher initiative was billed as a way to help poor children, many of them black and Hispanic, escape low-performing urban public schools. But it’s shifting rapidly to a program that serves middle-class white families, according to data released this week. It’s also getting a lot bigger, but we already knew that. The number of students getting taxpayer dollars to attend mostly religious private schools more than doubled this year, to 19,809 students, the Indiana Department of Education reported. But the demographic shift is equally striking. White students receiving vouchers grew from 46.4 percent in 2011-12, the program’s first year, to 56.4 percent this year. The percentage of black students among recipients has declined by a third in just two years. To what extent are white parents using state-funded vouchers to pull their children out of racially integrated public schools and send them to mostly white private schools? How often are we subsidizing moves from effective public schools to ineffective private schools? Those are among the questions that figures in the DOE report don’t answer. Indiana Gov. Mike Pence wants to provide financial incentives for teachers to transfer to charter schools or underperforming public schools. It’s an interesting idea, but other states have tried it with mixed results. Have we learned from their experience? Included in Senate Bill 264, Pence’s proposal would give $10,000 a year for up to two years to any teacher who moves to a charter school where at least half the students qualify for free or reduced-price lunches or any public school that got a grade of D or F.
Why isn’t it targeted to schools that are likely to need help? Fifty percent free-and-reduced-price lunch isn’t exactly high-poverty; the average FRL rate for Indiana public schools is 49 percent. And nearly one in five schools got a D or F last year. The Indiana State Board of Education approved A-to-F grades for public school corporations this week and – no surprise – the grades reflect poverty, just like the grades for individual schools do. Among the state’s 289 school corporations, most low-poverty corporations got As and Bs. But nearly three-quarters of high-poverty corporations got a grade of C or worse. There’s bipartisan support for making Indiana the 42nd state in the nation to fund pre-kindergarten. Wouldn’t it be nice if legislators produced a bipartisan bill to make it happen? Apparently that’s too much to ask, at least for now. House Bill 1004, approved last week by the House Education Committee, creates a pilot program to help fund preschool for 4-year-olds from low-income families. But it also opens another gateway to Indiana’s K-12 private school voucher program, already one of the most expansive in the country. Under the legislation, sponsored by Rep. Bob Behning of Indianapolis, children who take part in the state preschool program would qualify for vouchers once they hit kindergarten. Until now, vouchers have gone to students who transfer from public schools or who live in an attendance area for a public school that gets an F on the state grading system. They say that if you lie down with dogs, you’ll get up with fleas. If that’s so, progressive critics of the Common Core State Standards may find themselves doing some scratching. What started as a ragtag opposition led by a handful of angry moms is now a sophisticated national movement supported by top donors and strategists on the right. Conservative groups say their involvement already has paid dividends in the form of new members and troves of email addresses. Last week School Matters pointed out that Indiana school grades align with poverty: the more poor kids at a school, the higher the chance of a low grade. But there are many schools in the state that do quite well despite serving lots of students who are poor. One in five high-poverty schools – where two-thirds or more of students qualify for free or reduced-price school lunches – earned an A. More than one-third got an A or a B. These overachieving schools are found across the state. They are big and small, urban and rural. And almost none of them are charter schools. It’s not just that charter schools got worse overall grades than traditional public schools. That’s not surprising, because many charters enroll disproportionate numbers of kids from low-income families. But even adjusting for poverty, charter schools fared worse. Thirty-five percent of the state’s high-poverty schools – a total of 162 schools – received grades of A or B. But only three of those 162 were charter schools. 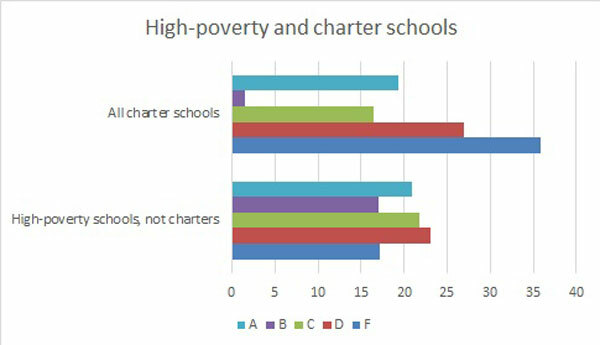 Among all charter schools, 21.5 percent got an A or B, and most of those are not high-poverty charters. It could be argued that, because many charter schools are located in and serve students from inner-city neighborhoods, it’s not fair to compare them to high-poverty schools across the state.